The power of humility, which bestows immortality, is the foremost among powers that are hard to attain. Since the only benefit of learning and other similar virtues is the attainment of humility, humility alone is the real ornament of the sages. It is the storehouse of all other virtues and is therefore extolled as the wealth of divine grace. Although it is a characteristic befitting wise people in general, it is especially indispensable for sadhus. Since attaining greatness is impossible for anyone except by humility, all the disciplines of conduct such as yama and niyama, which are prescribed specifically for aspirants on the spiritual path, have as their aim only the attainment of humility. Humility is indeed the hallmark of the destruction of the ego. Because of this, humility is especially extolled by sadhus themselves as the code of conduct befitting them. 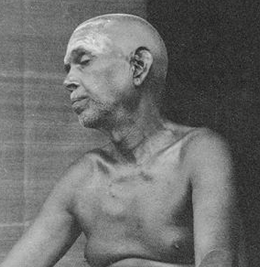 Moreover, for those who are residing at Arunachala, it is indispensable in every way. Arunachala is the sacred place where even the embodiments of God, Brahma, Vishnu and Sakti, humbly subsided. Since it has the power to humble even those who would not be humbled, those who do not humbly subside at Arunachala will surely not attain that redeeming virtue anywhere else. The Supreme Lord, who is the highest of the high, shines unrivaled and unsurpassed only because he remains the humblest of the humble. When the divine virtue of humility is necessary even for the Supreme Lord, who is totally independent, is it necessary to emphasize that it is absolutely indispensable for sadhus who do not have such independence? Therefore, just as in their inner life, in their outer life also sadhus should possess complete and perfect humility. It is not that humility is necessary only for devotees of the Lord; even for the Lord it is the characteristic virtue. One's greatness increases to the extent that one becomes humble. The reason why God is supreme to such an extent that the whole universe bows to Him is His sublime state of humility in which the deluded ego never rises unknowingly. Is it not on account of His behaving so humbly, as one ever in the service of every creature, that God stands worthy of all the glorious worships ever performed by all the worlds? By seeing Himself in all, by being humble even to devotees who bow to everyone, and by naturally remaining at such a pinnacle of humility that nothing can be humbler than Himself, the state of being supreme has come to the Lord.